As mentioned in the section What's Special about QM, much of the simplicity of QM™ derives from the fact that the models you create with QM™ are based on one of the QP™ active object frameworks. An important implication of this design is that the code generated by QM can only run within the QP framework, which means that such code must comply with the same licensing terms as the underlying QP framework (qpc, qpcpp, or qpn). 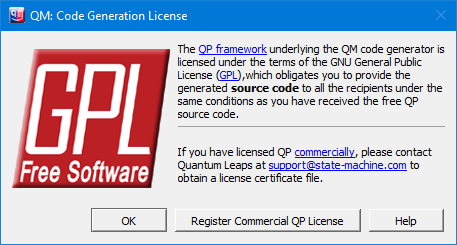 The structure of the Code Generation License Dialog Box reflects the dual-licensing policy of the QP frameworks. The dialog box allows you to choose between the two QP licensing options: (1) the open source GNU General Public License (GPL), and (2) one of the traditional closed source commercial licenses. 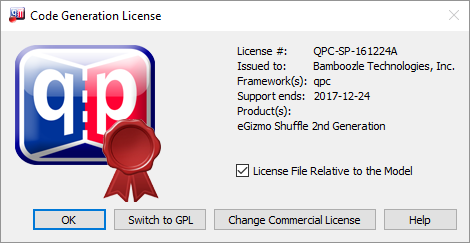 The choice of the licensing option made in the Code Generation License Dialog Box is reflected in the top-level file comments generated by QM (see also Code Engineering). the Register Commercial QP License button allows you to register a commercial license. This button opens the standard file-open dialog box through which you locate the Quantum Leaps QM license certificate file (file with extension .qlc), which is provided with your commercial license. the License File Relative to the Model checkbox specifies that the name of the license certificate should be saved inside the QM Model File, as a relative path to this model file. When the checkbox is not checked, the full absolute path to the license certificate is stored in the QM Session File. If you are a commercial licensee and for some reason you did not receive your QM License Certificate file, please send email with your license number to support@state-machine.com to request your copy.